“Good Pope John” changed the landscape of twentieth century Christianity. Born in Northern Italy in 1881, Angelo Roncalli was trained in Roman Catholic schools from an early age. After military service, Roncalli was ordained a priest in 1904. His passion for social justice for working people and for the poor was formed early and remained an important commitment of his ministry. Roncalli often received complicated assignments. He was made an archbishop in 1925 and sent as the papal envoy to Bulgaria where he was responsible for reducing the tensions between Eastern Rite and Latin Rite Catholics during a difﬁcult period. Some years later, he was the papal representative to Greece and Turkey when anti-religious sentiments were running high. His leadership in Turkey anticipated on a local scale some of the developments of later decades on a universal scale: putting the liturgy and the ofﬁcial documents of the church in the language of the people, and opening conversations with the Eastern Orthodox and those of other faiths. Near the end of the Second World War, he was made the papal nuncio to Paris with the task of trying to heal the divisions caused by the war. In 1953, at the age of 72, he was made a cardinal and appointed patriarch of Venice, the ﬁrst time he had ever been the bishop ordinary of a diocese. 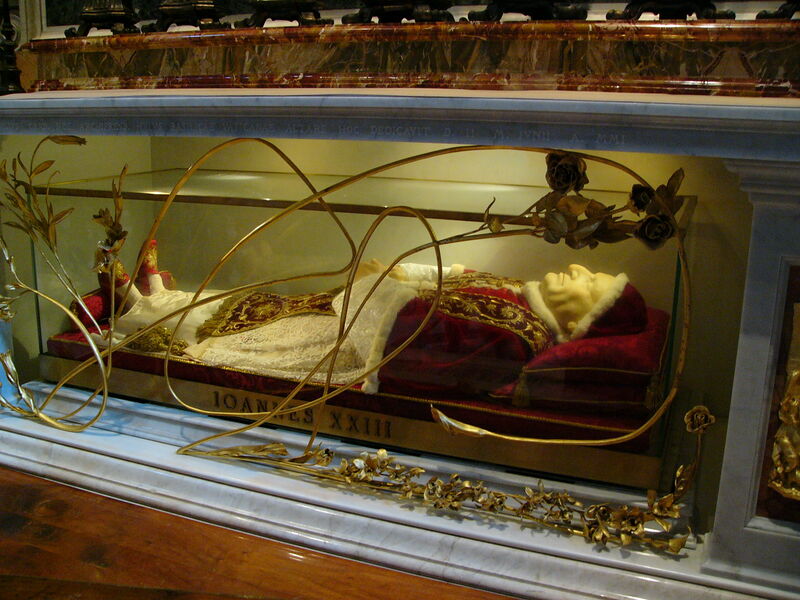 assumed that John XXIII would be a brief “placeholder” pope of minor consequence. During the ﬁrst year of his pontiﬁcate, he called the Second Vatican Council for the purpose of renewing and revitalizing the church. The work of the Council transformed the church of the twentieth century, not only for Roman Catholics, but for all Christians. With its emphasis on liturgical renewal, ecumenism, world peace, and social justice, the legacy of the Council continues to inspire the mission of the church among Christians of all traditions. I Lord of all truth and peace, who didst raise up thy bishop John to be servant of the servants of God and bestowed on him wisdom to call for the work of renewing your Church: Grant that, following his example, we may reach out to other Christians to clasp them with the love of your Son, and labor throughout the nations of the world to kindle a desire for justice and peace; through Jesus Christ, who is alive and reigneth with thee and the Holy Spirit, one God, now and for ever. Amen. II Lord of all truth and peace, you raised up your bishop John to be servant of the servants of God and gave him wisdom to call for the work of renewing your Church: Grant that, following his example, we may reach out to other Christians to clasp them with the love of your Son, and labor throughout the nations of the world to kindle a desire for justice and peace; through Jesus Christ, who is alive and reigns with you and the Holy Spirit, one God, now and for ever. Amen. Here, indeed, was a pope with saintly qualities. I’m delighted at the decision to include Good Pope John in the calendar. I was disappointed with the passage selected from the Hebrew Bible, it does describe, sort of, what he is best known for, I think that Micah 6:8 it be a better choice, describing him and what motivated him throughout his ministry, and ultimately to call For Vatican II. Bio: He needs a ‘Who he is’ and ‘Why he is important’ statement. And, a ‘He died in 1963’ statement. As a former RC, I revere Pope John for all he did. It seems Benedict is busily undoing what he can, which makes me wonder if there’s a slight political charge here? Also, like Michael, I’m a little uncomfortable mentioning him in our book of saints for Church-wide use. He might be one important reformer mentioned if there’s an ecumenical conference going on (ARCIC?) but as always I don’t think it’s our job here to mention every admirable person ever. The English Reformation hinged on NOT recognizing the Papacy. Although John was devoted to an ecumenical wideness, he was Pope, and in no way recognized, say, the validity of Anglican orders. Isn’t that a problem? We’re honoring someone who lived in my lifetime and who would not/did not ever set foot in an Anglican service. Finally… clasp? Really? It sound like we’re bushwhacking them with the love of Christ. (Which, you know, they think they have a corner on.) If we have to do this, even “embrace” would be better. Clasp seemed especially odd in the modern language collect. And speaking of the collects … the traditional language should say ‘clasp them with the love of thy son. Good Pope John will make an excellent addition to our calendar. Even his successors have been unable to completely destroy his work of reform . I don’t think we should include any popes in our calendar whose ministry postdates adoption of the doctrine that belief in the infallibility of the pope is necessary for salvation. Even if, as in this case, he was a good Christian man who did good things for the church. The Anglican position is quite explicit that Scripture contains all things necessary for salvation, and adding an allegedly infallible pope to our calendar undermines that, even if only by implication. There are other ways to show support for ecumeinism, liturgical renewal etc. Yes, but anybody can make a mistake. Actually he didn’t issue any proclamations ‘ex cathedra’ & seems to have been a pretty humble guy. Nevertheless– I still think explicit rejection of Anglican orders (in the context of Vatican II) is a pretty good reason not to add him to our calendar. This is another case where I think HWHM is more ambitious than well-thought-out. Does it really make sense to title the commemoration “Bishop of Rome” rather than “Pope”? I mean, no one denies that he was the pope, only his universal jurisdiction….and the bio uses the term freely. I do know it’s touchy though so it might not be a can of worms worth opening. The end of the first full paragraph — “remained an important commitment of his ministry.” — struck me as a little awkward. I concede Michael’s point on “Bishop of Rome,” though…. Interestingly enough, I found out earlier today that St. Thomas 5th Ave in NYC was the first (Anglican or RC) church to have an image of John XXIII in a stain glass window! My personal favorite “pope” is the original John XXIII — Baldassarre Cossa. If we put both Johns in, I’d almost be willing to keep Newman the Apostate. “through Jesus Christ, who is alive and reigneth with thee and the Holy Spirit, one God, now and for ever. Amen.” — What’s up with this? I know that “liveth” and “is alive” mean the same thing, but isn’t the connotation different? To me, “is alive” is little more than “is not dead” while “liveth […] with thee and the Holy Spirit” is a reference to the great mystery of the co-eternal, indivisible, and most blessed Trinity. Also, it’s not nearly as pretty and throws a quite nasty wrench into the Cranmerian cadence. I know that CofE has started to go down this route for their more modern resources in CW, but this is a marked and notable departure from our BCP that has little to commend it. Acts 22:3 “I am a Jew, born in Tarsus in Cilicia, but brought up in this city at the feet of Gamaliel, educated strictly according to our ancestral law, being zealous for God, just as all of you are today. Phil 3:5f circumcised on the eighth day, a member of the people of Israel, of the tribe of Benjamin, a Hebrew born of Hebrews; as to the law, a Pharisee; as to zeal, a persecutor of the church; as to righteousness under the law, blameless. If you change the Jewish references in these verses to Roman Catholic, they describe me. Total immersion wasn’t a method of baptizing, it was the neighborhood, parish, and family I lived, ate and breathed in, including Catholic schools from kindergarten through baccalaureate, a year in a novitiate (during Vatican II), two college years as a scholastic of a religious order and finally two more years as a lay person in a Jesuit university (with philosophy/theology for a major and minor). In all that time I never heard Pope John 23rd called “Good” Pope John. He was good – no argument. But to call him “Good” Pope John is (a) a “precious” digression from HWHM’s general treatment of names, (b) a curiously singular idiosyncrasy in a book of “holies” (like this one is good but the others in the book might all be charlatans) and (c) makes me wonder if it subtly belies the prejudice that Popes in general are to be regarded as generally under suspicion of being (by rubric) “Not-Good,” or if (d) it’s just an expression of astonishment that there was one who was “Good.” (Or, as another possibility (e) that there’s a lesser known “Bad” Pope John 23rd about whom I know nothing, but we nevertheless need some way to distinguish between the two.) The gist of this is, if we’re hesitant to change December 6th to “Jolly Old Saint Nick Day,” then, I humbly (?) submit, we should forego the adjective with J-23. Ditto the comments on clasp. Having a rule (such as the 50 year rule), then waiving it willy-nilly, devoid of any stated criteria to justify waiving, seems idiotic, prejudicial, and totally subjective and irrational. (And did I mention unprincipled? Queen of Hearts croquet for the pious.) I see no urgency in approving any of these earlier than the rule requires. Have the rule, change the rule, kill the rule, or state justifications for waiving the rule — I don’t care. This commemoration won’t be “ready” (according to our “rule”) until the 2015 convention. I see no reason to push it before then. “Vatican 2,” to a large extent, made surprising strides toward the Roman Church’s catching up to many of the important advances the Reformation accomplished, and some for which the Reformation laid groundwork. Nothing of the sort is intimated in this narrative. Some of the commenters have pointed out that some incipient gains of “Vatican 2” have been resisted or reversed in the RC community or by subsequent leadership. We shouldn’t present J 23 as if it (or he) achieved “once for all” results. J 23 called for it, precipitated its happening, imparted his vision to its participants, and gave tolerance to voices and viewpoints that had been, and would again be, viewed with disapprobation. Vatican 2 was by no means a tour de force or a one man show. It should not be presented as if it were. It failed to come to grips with sociological currents that would become powerfully significant for the Roman, as well as non-Roman, churches in subsequent decades, and left in place a homeostasis of authority that made progress as unlikely and unwieldy in the future as it had been in the past. As much as I welcome the efforts and character of this man, I feel there is a tendency in our narrative to lionize and idealize, while ignoring feet of clay. Most especially, its characterization of Vatican 2 seems fawning, naïve, and overstated. (“The work of the Council transformed the church of the twentieth century, not only for Roman Catholics, but for all Christians. With its emphasis on liturgical renewal, ecumenism, world peace, and social justice, the legacy of the Council continues to inspire the mission of the church among Christians of all traditions.”) I for one would like to see a more sober and balanced presentation of it, vis a vis the rest of the Christian church, especially in the western world including the Reformation’s tenets and Anglican orders. Since we are honoring popes who led crusades that resulted in both Jewish and Islamic deaths, it would be nice to include a pope who tried to bring the RC church into the 20th century. In addition to the bio pretty vastly overstating the accomplishments of Vatican 2, you are right to point out that Vatican 2 was in no way a one-man show. Actually, much of the business of Vat 2 was carried out during the papacy of the far less beloved Paul VI, who just didn’t have that fatherly common touch– though both popes following took both their names. My thesis is about the Anglican pilgrimage tradition at Walsingham, which has been a field on which Anglican-RC relations have been on display for many years, and through many dramatic changes. Currently the 2 shrines cooperate in many things, even sharing a web portal. But even now, truly concelebrated Masses remain a dream– the Cardinal Archbishop of Westminster has even visited the Anglican shrine (long story) but he would never sign off on such a thing. Is it true that this interesting journey will end very soon? I hope not, but if so– thanks to all of you for making every day I’ve been able to visit interesting, entertaining, and thought-provoking. I wish we could all get together for coffee or Anglican beverages! This commemoration should be held over until 50 years after his death. The 2015 GC should consider it. I see no good reason why John’s names should be spelled out in the title. “John XXlll” is sufficient. Again, let’s not repeat that anti-RC business of calling him “Bishop of Rome” in the subtitle.. We should call a Pope a Pope. Delete the redundant first paragraph–the “headline writer” is at it again. BTW, I never heard him called “Good Pope John”–not that I disagree with the epithet. Why should he not share the date of his death (June 3) with The Martyrs of Uganda? Line 1, second paragraph: add “Sotto il Monte,” after “in”. Line 1, second paragraph: substitute “on November 25,” for “in”. recommendation to delete his full name in the title is followed. the point of his widespread influence more sustainably. 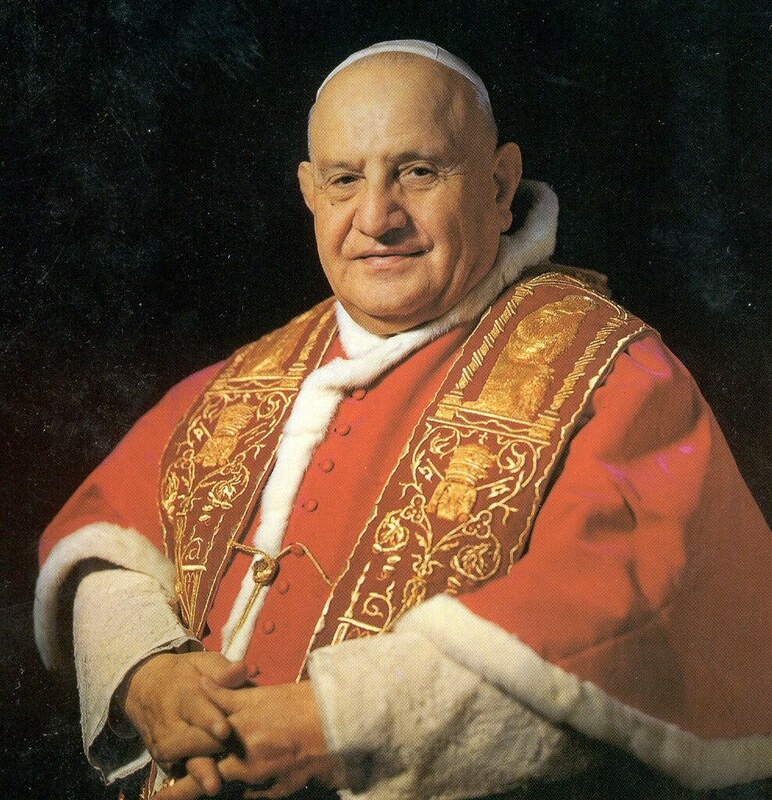 As a (Roman) Catholic, I have only just discovered that the commemoration of Blessed John XXIII which is due to be celebrated on 11 October, the anniversary of the opening of Vatican Council 2 is not being observed this year. I have been searching diligently for his COLLECT and found it here. Thank you ! From the blog administrator: Thanks for your post. next time please leave your first and last name.